YAKIMA'S LEGENDARY ROCKABILLY KING, guitarist Jerry Lee Merritt, left his local band the Pacers in 1958 to join Gene Vincent for his riotous ‘59 overseas tour and one studio LP, Crazy Times. But that’s a whole ‘nother story . . . Meanwhile, the Pacers rock­ed on with new members including Mike Mandel (piano). 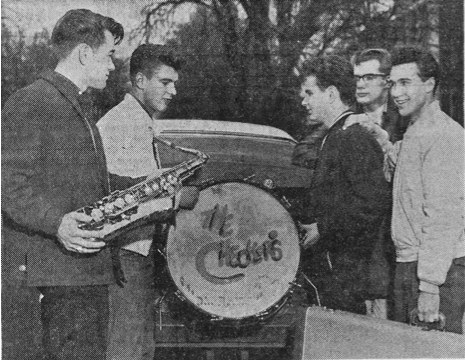 The band held down a steady gig at the Walk In Club -- Yakima's early teen hangout -- but were eventually ousted by crosstown rivals, the Rumblers.